Hope your holidays are going well! 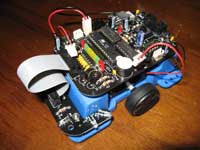 My sweet wife gave me a super cool programmable robot from Microrobot! I've already downloaded and run through the various test programs. Can't wait to tweak some code and get it to do something interesting. It's got two interface boards; one for use with maze solving & obstacle avoidance, the other for line following. It's built around an Atmel AVR ATmega8L processor and uses dual Sanyo LB1630 motor controllers. I'm new to the AVR world. Thus far all my embedded programming experience (I use the word "all" rather loosely...) has been on the Basic Stamp 2. Simple, easy to use, etc. But most of my plain old coding has been done on Unix using good ol' Emacs, C/gcc, etc., so perhaps it'll be a short learning curve... Here's what I've done so far: run a few test programs and gotten the bot to spin.